To anyone who played Sims, this looks pretty familiar. As the classic saying goes, “if you want to make a chore-bot, you’ll need to crack some plates.” The old adage encapsulates a major problem facing those working on robotic household assistants: how do you build a robot that completes all the tiny steps in a task humans do with ease, like setting the table or folding laundry? And how can you train them to complete them without breaking a lot of stuff along the way? Enter VirtualHome, a new project out of the MIT Computer Science and Artificial Intelligence Laboratory, a place where AI can rehearse complicated tasks and household chores in a simulated, virtual world. The idea is that by mastering certain commands in the simulation, we could someday have robots with AI systems that can more easily perform these tasks in the real world. VirtualHome looks an awful lot like a version of The Sims. 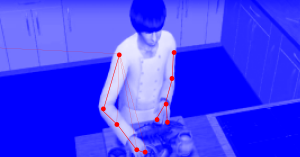 The AI, depicted as human-like avatars, are confined to a Sims-looking house, and they move just about as naturally through it as those do in the game. That sitting position doesn’t look normal and comfortable, but it’s still impressive that the AI, when told to watch TV, knew to turn on the TV itself, go find and grab the remote control, walk over to the couch, and sit facing the TV set. These are the sort of tasks that a person would generally be able to comprehend immediately but would be too confusing for current AI systems that need detailed, step-by-step instructions. This isn’t the first attempt to get algorithms to understand language with nuance that will better match the sort of casual commands that a person might give their household robot. For instance, in 2017, researchers from Brigham Young University trained an AI system to read all of Wikipedia (casual) to learn the context in which different words fit together, according to Live Science. Using VirtualHome, the MIT computer scientists have trained AI to do about 1,000 different tasks that one might expect a household robot assistant to be able to do. Some of these include: going into different rooms to fetch certain objects, making coffee, cooking something on the stove. Someday, robots trained in this way could be a great help for the elderly or people who have trouble getting around, and perhaps even to the average person. But until they become useful, at least they’re entertaining to watch.